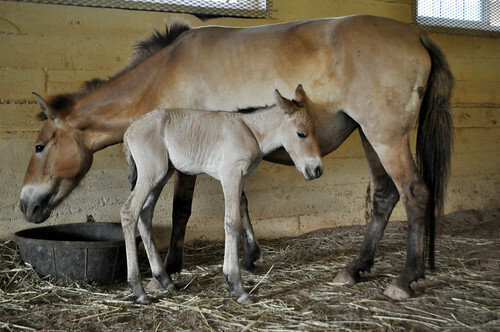 The endangered species of the week is Przewalski’s Horse (pronounced “sheh-val-skee”). This horse is native to plains and grasslands of Mongolia, as well as other parts of Asia and eastern Europe, but I first saw one at the National Zoo’s Smithsonian Conservation Biology Institute in Front Royal, VA. Although these horses are small (about 13 hands high and between 550 and 750 pounds), they’re impressive with tan fur on their bodies and a short, dark mane and tail. They have evolved to survive the harsh winters in Mongolia, but in the 20th century the species had trouble surviving in the face of habitat loss, loss of water sources to domestic animals, and overhunting. The Przewalski’s horse was declared extinct in the wild by the World Conservation Union in 1970. Thanks to an active captive breeding program, Przewalski’s horses were reintroduced to the wild in 2008. There are currently 1,500 horses in captivity worldwide, and approximately 400 horses in reintroduction sites in Mongolia, Kazahkstan, and China. All of today’s current population of Przewalski’s horses come from 14 ancestors. Thus, the gene pool for this horse is very narrow. Scientists must very carefully coordinate breeding among the captive horses to try to maximize genetic diversity and make the population more able to withstand various stresses, such as disease. So Przewalski’s horse is beautiful, but why should we care about its survival? Because a species like this one tells us when we’re having too much of an impact on the ecosystem. Humans are part of the natural world; we depend on natural resources for our survival. But sometimes we take more than our share, and the ecosystem on which we depend begins to suffer. Species like Przewalski’s horse tell us when our agricultural or hunting practices are unsustainable. It is the only truly wild horse remaining in the world (it’s never been tamed for riding). Prezwalski’s horses can make it through winter in Mongolia without a horse blanket. The Mongolian name for these horses is “takhi,” which means “spirit.” That’s way cooler than names like Chicken Lips or Buck Naked. Przewalski’s horses have 2 more chromosomes than domestic horses(66 vs. 64).